You probably heard about Croatia joining the European Union last year, but did you know the EU expanded further this year...in Africa? The French overseas department of Mayotte, a group of islands in the Indian Ocean northwest of Madagascar, became officially part of the EU on January 1. Mayotte's entrance into the European Union is the result of it becoming an "overseas department" of France in March 2011. An overseas department is considered to be a fully integrated part of France, just like any other of the country's departments (a governmental unit similar to a province or county). This means that the people are not only represented in the French legislature and can vote in both French and European Union elections, but also must follow almost all the same laws as anyone living in the European part of France. Mayotte became a French colony in 1841, after centuries of rule by East African kingdoms. Part of the Comoro Islands, an archipelago located between Madagascar and mainland Africa, the people of Mayotte were allowed a vote on the question of independence in 1974. Independence proved very popular on the rest of the Comoro Islands, which soon became the independent Union of the Comoros (still one of the world's nearly 200 independent countries today). Mayotte itself, however, voted against it. The majority of its people preferred to remain a French territory, and reaffirmed this with a vote of 99% against joining the independent Comoros in 1976. (The Comoros still claim Mayotte as their own, with a 1976 UN Security Council resolution in their support failing after a rare French veto). 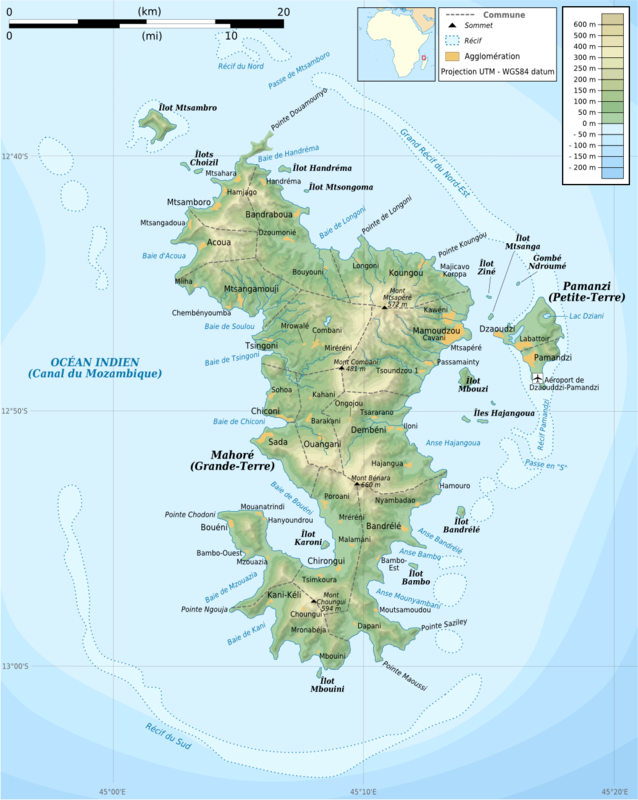 At that time, Mayotte was an overseas territory belonging to France, but not considered part of the country itself. However, in 2000 the islands voted to enter a ten-year transition period on the way to joining France proper as an overseas department. From 2001 to 2011, Mayotte was a "departmental collectivity", considered part of France but with many of its own separate laws. A final referendum in 2009 confirmed that it would become an overseas department in 2011. Though becoming part of the EU was an expected outcome of gaining department status, Mayotte's entry into the organization was not set to take effect until Jan. 1, 2014. The occasion of Mayotte's entry into the EU was marked by a special visit from the flagship of the European Union Naval Force. 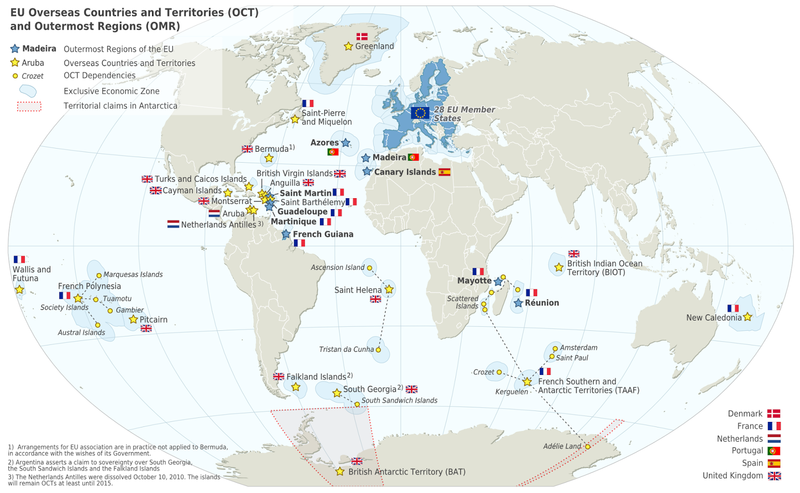 Within the European Union Mayotte is now classified as an "outermost region". This means that it's subject to most EU laws, but may be eligible for some exceptions because of practical issues related to not actually being in Europe. For example, other French outermost regions use the euro as their currency, but don't collect EU value-added tax (VAT) and maintain separate border controls. Mayotte is now one of two EU outermost regions located in the Indian Ocean, the other being fellow overseas department Réunion. Graphic of the locally-used flag of Mayotte is in the public domain (source).